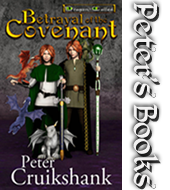 Peter Cruikshank’s Fire of the Covenant (Dragon called legend, book 1) is an outstanding debut novel that is sure to appeal to epic fantasy lovers of all ages. It’s the story of Princess Willoe – who is much happier with a sword in her hand than socialising with the ladies at court; and her twin brother Prince Rowyn – who would rather be studying in his uncle Brom’s tower than swinging a sword on the training ground. Unfortunately for the twins their grandfather, the King of Cainwen, has other ideas for them with Willoe to be married off and Rowyn to take up the life of a man-at-arms. But there is something special about these siblings and the King isn’t the only one who has plans for their future. Pursued by the priests of a religious order who would use the twins’ talents to dominate the world, Willoe and Rowyn come to learn of a covenant made by one of their ancestors with the King of the dragons – and the heartbreaking role they have to play in it. 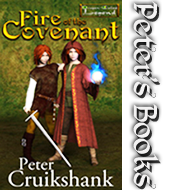 Fire of the Covenant contains all the elements you’d expect from a classic epic fantasy romp with more battles, magic, elves, dwarves (or dwarf-like creatures), dragons and deities than you can poke a sword at. And while there is plenty of action and intrigue to keep readers turning the pages, the real strength of the story lies in its characters. 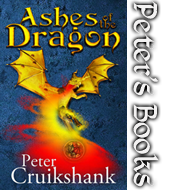 Cruikshank has crafted some wonderful characters to fill his well-realised world, with likeable protagonists, deplorable villains and a supporting cast that are full of surprises. I found myself caring about these characters and wanting to know more about them as the story unfolded. Fire of the Covenant kept me engaged right to the very last page and had me craving the next book in the series.